Digital investment bank Digi-Capital has just published the Q3 Transaction Update of its Global Games Investment Review 2012. Commenting on the Update, Digi-Capital Managing Director Tim Merel said “Games M&A for 2012 is at a run rate 40% higher than 2011 (the previous record year), having delivered 105% of the transaction value of all of 2011 by the end of Q3 2012. As we anticipated, 6 of the 10 largest games M&A transactions to Q3 2012 were made by Chinese, Japanese and South Korean acquirers. 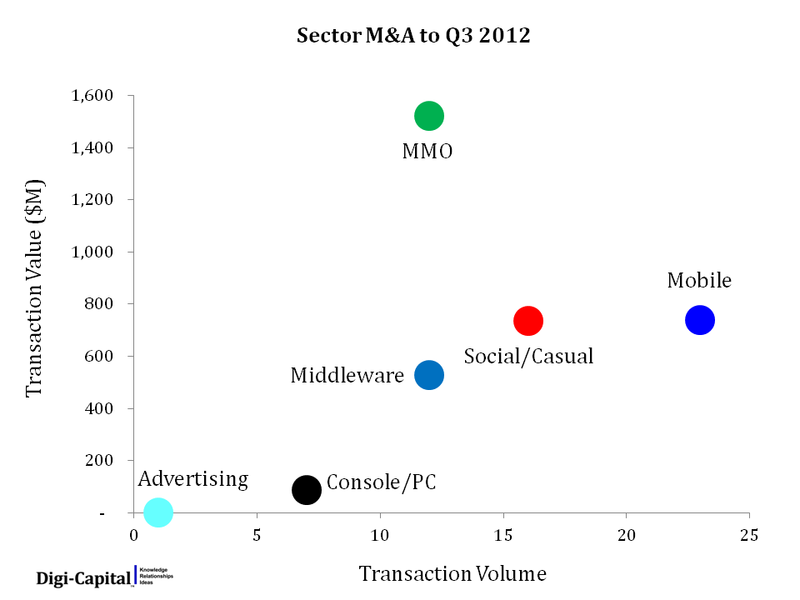 The broader games investment and M&A trends from H1 2012 have continued through Q3 2012, with new emerging trends which could be borne out during Q4. Our prediction that the Zynga IPO might have been the high water mark for Social Games 1.0 investment has been validated, with the VC market moving sharply away from that sector. For public companies, the Update also details how companies in some sectors and geographies are trading at 12 month highs, while others are not enjoying the same level of appreciation by investors. The combination of accelerating M&A, changing investment and valuations has seen an acceleration in our Strategic Review and transactional work for games companies, including strategic pivots across sectors/geographies, sell and buy side M&A, and fundraising/investment to accelerate growth. As detailed in the Review, 2011 was a record year for games M&A with 113 transactions generating $3.4B transaction value at an average transaction value of $30M. That record has already been beaten this year, even though 3 months remain. To Q3 2012, 71 transactions generated $3.6B transaction value at an average of $51M. 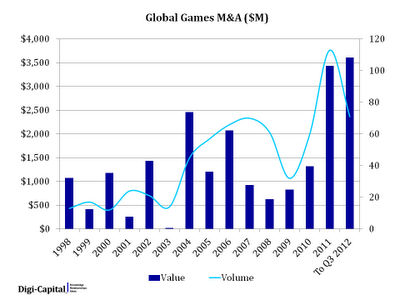 The Q3 2012 run-rate for games M&A transactions is 40% higher by value but 16% lower by volume than 2011 because of fewer, larger M&A transactions. 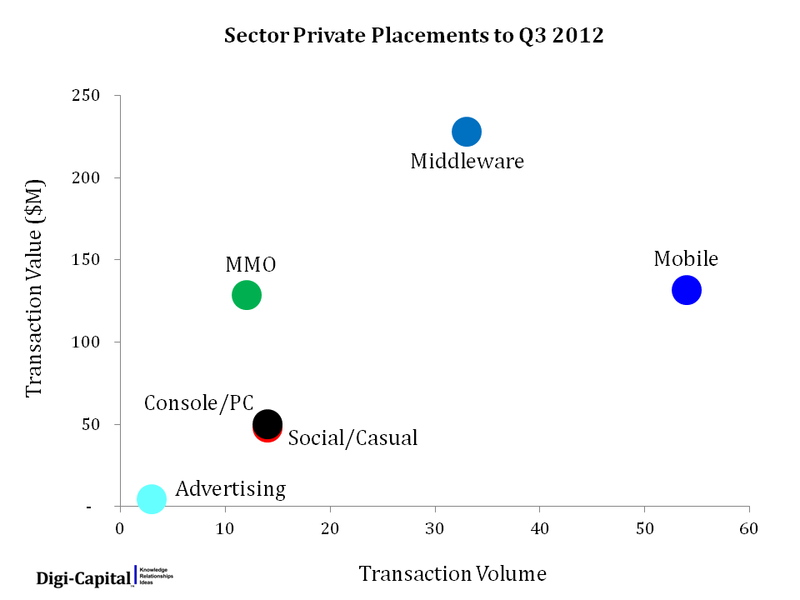 As has been the trend in H1 2012, MMO, Mobile, Social/Casual and Middleware continue to dominate, and we anticipate that this trend might continue through Q4 2012. Our largest Chinese, Japanese and South Korean clients are particularly focused on M&A and investment in mobile-social, free-to-play MMO and middleware to leverage their strengths both domestically and internationally. Our large US and European clients are fishing in a similar waters, but bring different strengths to the table. For the strongest independents who we work with, the accelerating M&A market is prompting some to consider their strategic options. 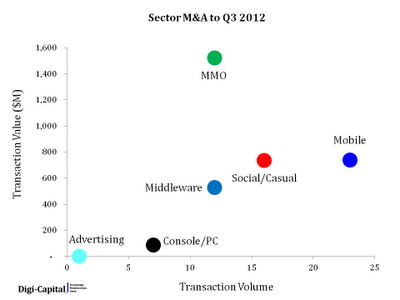 Games M&A transactions and public company comparables across sectors and geographies are detailed in the full Review. As detailed in the Review, 2011 was also a record year for games investment with 152 transactions generating $2B transaction value at an average transaction value of $13M. However to Q3 2012, 130 transactions generated $591M transaction value at an average of $4.5M. Compared to the average run rate of games investment for 2011, to Q3 2012 transaction volume is up by 14% but transaction value is down by 60%. Should this trend persist, games investment for 2012 might return to the still respectable levels of 2010 (the second highest year). Middleware, Mobile and MMO dominated, and the change which accounts for the decline in transaction value comes almost entirely from Social/Casual. In 2011 Social/Casual accounted for 57% of transaction value and 32% of transaction volume, but to Q3 2012 it accounted for 8% of transaction value and only 11% of transaction volume. So our original view that Social Games 1.0 is a consolidating sector could continue through Q4 2012, with 2011’s wave of VC social games investment appearing to be over. Games middleware generated 39% of transaction value and 25% of transaction volume, with gamification (particularly education and health), cross-platform mobile technology, game discovery platforms and games peripherals/hardware emerging as investment trends. Given VC market fondness for platform investments, this trend seems highly consistent. 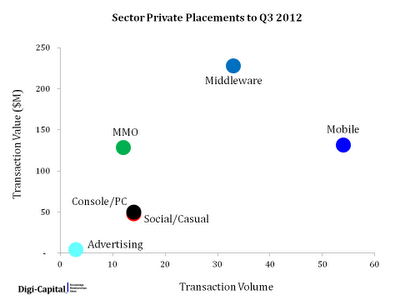 Mobile games investment accounted for 22% by transaction value and a significant 42% by transaction volume, and mobile (mobile-social in particular) games investment could continue through Q4 2012. The success of free-to-play continues to attract investors to MMO, accounting for 22% of transaction value and 9% of transaction volume. Independently Kickstarter has emerged as a complement to VC funding, which we might explore in more detail in the 2013 Review early next year. Investment transactions and public company comparables across sectors and geographies are detailed in the full Review. Looking at public company comparables (enterprise value/sales, enterprise value/operating profit and price/earnings), the Review details how companies in some sectors and geographies are trading at 12 month highs, while others are not enjoying the same level of appreciation by investors. These changes could be a significant factor in trends we are seeing emerging in private M&A. Disclaimer: This document has been produced by Digi-Capital Limited and is furnished to you solely for your information and may not be reproduced or redistributed, in whole or in part, to any other person. No representation or warranty (expressed or implied) is made as to, and no reliance should be placed on, the fairness, accuracy or completeness of the information contained herein and, accordingly, Digi-Capital Limited does not accept any liability whatsoever arising directly or indirectly from the use of this document. In particular, the inclusion of any financial projections are presented solely for illustrative purposes and do not constitute a forecast. The recipient should independently review the underlying assumptions of the financial projections. This document is intended for initial contact with individuals and entities known to Digi-Capital Limited. This document is intended for use by the individual to whom it is sent, it is confidential and may not be reproduced in any form, further distributed to any other person, passed on, directly or indirectly, to any other person or published, in whole or in part, for any purpose without the prior written consent of Digi-Capital Limited. In the event that you are not the recipient indicated and you have inadvertently received this document, please delete it immediately. This document does not constitute or form part of, and should not be construed as, an offer, solicitation or invitation to purchase, subscribe for, or otherwise acquire any securities nor shall it or any part of it nor the fact of its distribution form the basis of or be relied upon in connection with any contract or commitment whatsoever. Any investment decision should be made solely on final documentation, and then only after review of the diligence materials and consideration of all relevant risks. Digi-Capital Limited does not have any responsibility for the information contained herein and does not make any representations or warranties, express or implied, as to the adequacy, accuracy or completeness of any statements, estimates or other information contained in this document. The information contained herein, while obtained from sources believed to be reliable, is not guaranteed as to its accuracy or completeness. This document may include forward-looking statements, including, but not limited to, statements as to future operating results and potential acquisitions and contracts. Forward-looking statements are sometimes, but not always, identified by their use of a date in the future or such words as “anticipates”, “aims”, “could”, “may”, “should”, “expects”, “believes”, “intends”, “plans” or “targets”. By their nature, forward-looking statements are inherently predictive, speculative and involve risk and uncertainty because they relate to events and depend on circumstances that will occur in the future. There are a number of factors that could cause actual results and developments to differ materially from those expressed or implied by these forward-looking statements. No assurances can be given that the forward-looking statements in this document will be realised. Digi-Capital Limited does not intend to update these forward-looking statements. No securities regulatory authority has approved or expressed an opinion about Digi-Capital Limited’s business prospects or any related securities. Any such securities have not been and will not be registered under the United States Securities Act of 1933, as amended (the "Securities Act"), or any other state or federal securities laws and may not be offered or sold in the United States of America absent registration under the Securities Act or an exemption from the registration requirements thereof. Digi-Capital Limited and any entity referred to in this document have not and will not be registered under the United States Securities Exchange Act of 1934, as amended or the US Investment Company Act of 1940, as amended, and any related securities may not be offered or sold or otherwise transferred within the United States or to, or for the account or benefit of, U.S. persons except under circumstances which will not require Digi-Capital Limited or any associated entity to register in the United States in accordance with the foregoing laws or any other law. Digi-Capital Limited is authorised and regulated by the Financial Services Authority. Digi-Capital Limited is the copyright owner of this document and does not grant you any licence to copy, adapt or distribute it, in whole or in part, without Digi-Capital Limited’s written permission to do so. Digi-Capital (www.digi-capital.com) is an investment bank for games, apps, digital media/services and tech/telecoms across America, Asia (China, Japan, South Korea) and Europe.